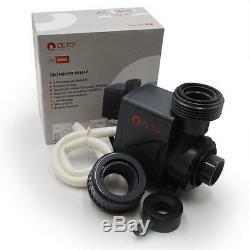 REEF OCTOPUS - AQUATRANCE SKIMMER PUMP 3000S. Cost effective Octopus Protein Skimmer Pumps provide exceptional performance at an economical price. Direct replacement pumps for newer Reef Octopus Classic protein skimmers modified with large grey threaded outputs. Replacement pump for the following Reef Octopus skimmer models: CLSC-200INT (NWB 200), CLSC-200EXT (DNWB200), Diablo 200, Extreme 200, Diablo 225, Classic 225, SRO 3000int. Requires special output adapter to mate to skimmer body. Aquatrance 3000s Pinwheel Pump Power Consumption: 35watts Air Draw: 880 lph / 31SCFH Water Draw: 211gph. Air and water results will vary depending on aquarium setup. Reef Octopus can not be responsible for consequential damages arising from installation or use of this product. We learned early on that going that extra inch can help your business tremendously. Setting up our store in this manner makes for a better overall experience for you the customer. The item "REEF OCTOPUS AQUATRANCE SKIMMER PUMP 3000S" is in sale since Wednesday, January 25, 2017. This item is in the category "Pet Supplies\Fish & Aquariums\Filters". The seller is "saltwateraq" and is located in Fairfield, Pennsylvania. This item can be shipped to United States, Canada, United Kingdom, China, Mexico, Germany, Japan, Brazil, France, Australia, Denmark, Romania, Slovakia, Bulgaria, Czech republic, Finland, Hungary, Latvia, Lithuania, Malta, Estonia, Greece, Portugal, Cyprus, Slovenia, Sweden, South Korea, Indonesia, Taiwan, South africa, Thailand, Belgium, Hong Kong, Ireland, Netherlands, Poland, Spain, Italy, Austria, Israel, New Zealand, Philippines, Singapore, Switzerland, Norway, Saudi arabia, Ukraine, United arab emirates, Qatar, Kuwait, Bahrain, Croatia, Malaysia, Chile, Colombia, Costa rica, Dominican republic, Panama, Trinidad and tobago, Guatemala, El salvador, Honduras, Jamaica.